Manufactured using image magnifying-based optical measurement system which assures the opening sizes and wire diameters of wire cloth used for test sieves is traceable to National Standards. When your sieve was manufactured. Which batch of wire cloth was used to manufacture the sieve. 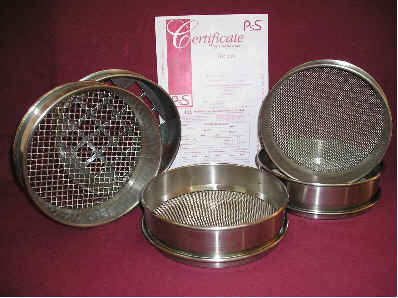 Included with each Sieve is a Certificate of Conformity to the applicable specifications bearing the serial number of your sieve. Our aim is to support and augment your quality system.